But Medicine is a demonstrative Science, and all its processes should be proved by established principles, and be based on positive inductions. That the proceedings of Medicine are not of this character, in to be attributed to the manner of its cultivation, and not to the nature of the Science itself. Samuel Jackson, Principles of Medicine (1832). Quoted in Alva Curtis, A Fair Examination and Criticism of All the Medical Systems in Vogue (1855), 1. Experiment is fundamentally only induced observation. Section title in An Introduction to the Study of Experimental Medicine (1865), as translated by Henry Copley Greene (1957), 19. 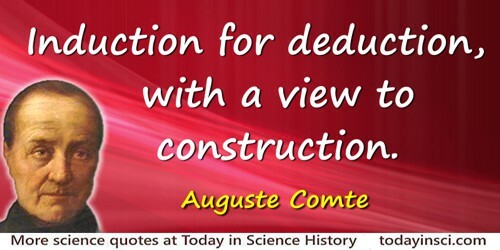 Experiments may be of two kinds: experiments of simple fact, and experiments of quantity. ...[In the latter] the conditions will ... vary, not in quality, but quantity, and the effect will also vary in quantity, so that the result of quantitative induction is also to arrive at some mathematical expression involving the quantity of each condition, and expressing the quantity of the result. In other words, we wish to know what function the effect is of its conditions. We shall find that it is one thing to obtain the numerical results, and quite another thing to detect the law obeyed by those results, the latter being an operation of an inverse and tentative character. Principles of Science: A Treatise on Logic and Scientific Method (1874, 1892), 439. Facts are not pure unsullied bits of information; culture also influences what we see and how we see it. Theories, moreover, are not inexorable inductions from facts. The most creative theories are often imaginative visions imposed upon facts; the source of imagination is also strongly cultural. In The Mismeasure of Man (1981, 1996), 54. 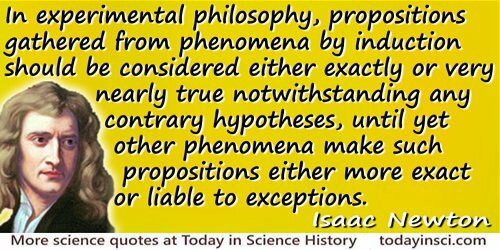 I am convinced that it is impossible to expound the methods of induction in a sound manner, without resting them upon the theory of probability. Perfect knowledge alone can give certainty, and in nature perfect knowledge would be infinite knowledge, which is clearly beyond our capacities. We have, therefore, to content ourselves with partial knowledge—knowledge mingled with ignorance, producing doubt. The Principles of Science: A Treatise on Logic and Scientific Method, 2nd edition (1877), 197. If men of science owe anything to us, we may learn much from them that is essential. For they can show how to test proof, how to secure fulness and soundness in induction, how to restrain and to employ with safety hypothesis and analogy. Lecture, 'The Study of History' (11 Jun 1895) delivered at Cambridge, published as A Lecture on The Study of History (1895), 54. The Principia: Mathematical Principles of Natural Philosophy (1687),3rd edition (1726), trans. I. Bernard Cohen and Anne Whitman (1999), Book 3, Rules of Reasoning in Philosophy, Rule 4, 796. Attributed in John Arthur Thomson, quote at heading of chapter 'Scientific Method', Introduction to Science (1911), 57, but without further citation. Webmaster has found no primary source for confirmation. Please contact if you can help. Induction may be defined, the operation of discovering and proving general propositions. In A System of Logic, Ratiocinative and Inductive: Being a Connected View of the Principles of Evidence, and the Methods of Scientific Investigation (1843), Vol. 1, 347. Induction. The mental operation by which from a number of individual instances, we arrive at a general law. The process, according to Hamilton, is only logically valid when all the instances included in the law are enumerated. This being seldom, if ever, possible, the conclusion of an Induction is usually liable to more or less uncertainty, and Induction is therefore incapable of giving us necessary (general) truths. Stated as narrative, not a direct quote, by his biographer W.H.S. Monck in 'Glossary of Philosophical Terms', appended in Sir William Hamilton (1881), 181. It is often in our Power to obtain an Analogy where we cannot have an Induction. Observations on Man, His Frame, His Duty, and His Expectations (1749). From Richard III (Nov 1633), Act 1, Scene 1. In The Plays of William Shakespeare (1804), Vol. 5, 2. The only hope of science is genuine induction. In Maturin Murray Ballou, Edge-Tools of Speech (1899), 440. Aphorism 14. In Francis Bacon and Basil Montagu, The Works of Francis Bacon (1831), Vol. 14, 32. In A Treatise on Probability (1921), Chap. 22, 259. Whatever things are not derived from objects themselves, whether by the external senses or by the sensation of internal thoughts, are to be taken as hypotheses…. Those things which follow from the phenomena neither by demonstration nor by the argument of induction, I hold as hypotheses. As quoted in Ernan McMullin, 'The Principia: Significance For Empiricism', collected in Margaret J. Osler and Paul Lawrence Farber (eds. ), Religion, Science, and Worldview: Essays in Honor of Richard S. Westfall (2002), 38. When you say, “The burned child dreads the fire, “ you mean that he is already a master of induction. Epigraph in Isaac Asimov’s Book of Science and Nature Quotations (1988), 132.